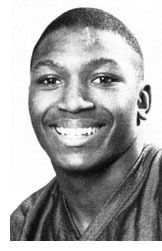 "You will hear from Darrel Taylor some day, and it won't be about football, either," Richwoods coach Rod Butler said in describing the 1990 Peoria Area Player of the Year. Above the awards, statistics and records the Knights fullback amassed in three seasons, two stand out: Of the 39 varsity games in which the 5-foot-6 fullback carried the football, Richwoods won 37. The player Butler liked to refer to simply as "a winner" is also the all-time rushing leader in the 32-year history of the Mid-State 9 Conference. Taylor's career M-S 9 records are 776 carries, 4,664 yards and 58 touchdowns. He was the first sophomore ever to start at fullback at a school that featured the position in a record eight-year reign as M-S 9 champion while winning 68 of its last 69 regular-season games. During Taylor's tenure, the Knights won the 1988 Class 5-A state championship and fashioned a 10-2 record in the three playoff appearances.